I must admit that when Charles said he was working in the Southwest suburbs and that perhaps it was time to try a Latin eatery in Eden Prairie, I was not all that thrilled. I had images of strip mall chains and deep fried burritos. As I searched and searched for something that might be a good match for our Latin Tongue series, I stumbled upon a place called Aurelia's. The reviews were as expected, including much praise from folks who love burritos and use the word authentic endlessly. There were also the negative reviews from folks who claim to know how things should be made, like what should be in salsa, as if there was only one way to make it. In the end, I had no better idea what this place would be like than I did before I read the reviews and it became apparent that Aurelia's needed the Simple, Good and Tasty treatment…a real review with real photos and a couple of really open minds. If you would indulge me, I would like to ramble on about perspective and business…again. Why? Because Aurelia's is the exact type of place that could get labeled authentic or not when once again, labels do nothing but a disservice to us all. Having owned a restaurant myself, I have a lot of sympathy for the fact that you can serve what you love, but you also have to serve what will sell. This looks a lot different if you are in a small town, an affluent suburb, the inner city, or a college town. Yet, we still tend to review and judge with only one lens, the lens of expectation. Is this fair? If we had gone into Aurelia's expecting a taqueria straight from Mexico City, we would have been fools, yet it is obvious that some people will only be satisfied if this is the case. If we had gone there expecting it to be just like our favorite Latin eatery, that would be preposterous. Not because we can't expect things to be good, but it would be insane and boring if we wanted everything to be the same. All of our differences are what make life interesting and eating an adventure worth having. Spoiler alert: I am about to reveal our whole experience in a nutshell. Aurelia's was outstanding…but not for one reason, for many. It was outstanding because the owner and chef both came out to see how things were tasting and ended up talking about their food for many minutes. It was outstanding because we came to see that they were crafting this food with care, with a direct connection to their Oaxacan roots and with a business acumen that took into account the clientele that they serve in Eden Prairie, a mostly white, affluent suburb. This means that you can get a simple burrito with chicken or steak, but you can also get barbacoa, al pastor, or carnitas. 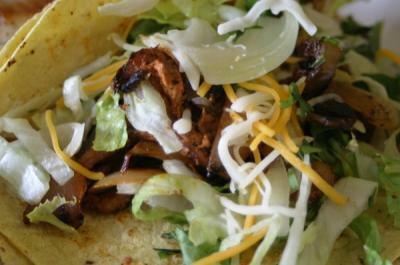 You can get a taco with lettuce and cheese or the standard Mexican taco with just onions and cilantro with your meat. 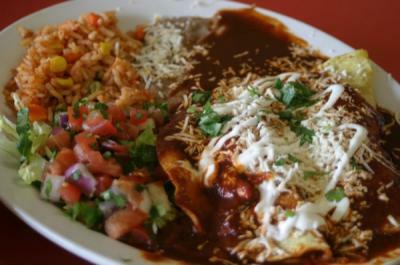 Enchiladas are standard menu fare, but their guajillo pepper sauce is not. Everything is made from scratch, nothing frozen. They have found a way to keep a love for the food they know best and still sell a product that is approachable for anyone. I think this model is brilliant. For once, ordering was actually pretty easy. Had we known that they will basically make anything you want, whether it is on the menu or not, we would have been daunted. Luckily, we found that out much later. As al pastor tacoper our intro article laying out the guidelines to this project, we needed to order tacos and tamales, which they had. The question was really how to order the tacos. They have them as a dinner plate, but we wanted a la carte and they were happy to oblige. We wanted a full sampling and ordered the al pastor, carnitas, barbacoa, and fish tacos. For tamales, we decided on one pork with green sauce and one chicken with red. 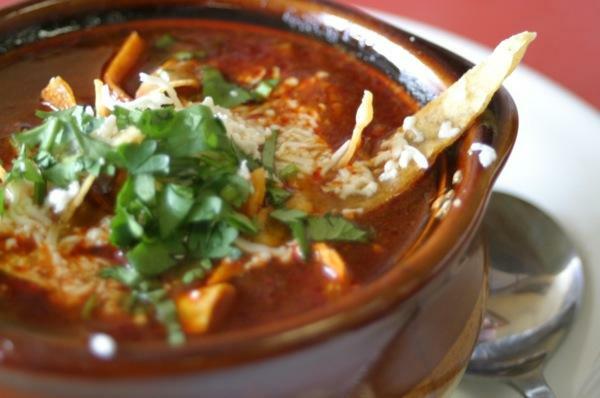 Next up was the obvious choice on a cool Autumn day: the Aztec tortilla soup. It was a unique offering compared to the more typical menudo, pozole, and beef stews that we typically run across. Finally, we decided that it had been much too long since we had ordered enchiladas and since they offer a deep red guajillo sauce as an option, it was not a tough choice. The place was really busy during the lunch hour and our food came out in shifts. I'm sure that they were more than a little challenged by us when we ordered eight different items. That is a lot to juggle in a small space that was already at capacity. The Aztec tortilla soup (pictured at top) came out right away and we were glad for it. It was inviting in its little crock, with crispy tortillas strips, cheese, and cilantro gracing its top. It was even more inviting to our bellies. This was a rich and hearty soup. It was loaded with chicken, carrots, corn, and other veggies, but more than that, the broth had real depth. It definitely wasn't just a chicken or vegetable broth, but more like a beef broth, which really complemented the deep dark earthiness of the peppers. It was tasty, satisfying, and nourishing. the ohhhh so good fish taco! The tacos came out next and it is our habit to want to dig right in, often with our fingers, picking out pieces of meat and getting a good sense of what flavors are present while things are nice and hot. Our surprise was surely noticeable. We were dealing with some tasty food. The al pastor was not from a vertical rotisserie, nor was it able to be cooked over an open fire like in Mexico. However, it had a great char from the grill to mimic the traditional open fire cooking methods and as an added bonus, the pastor is served with grilled onions, which are charred, slightly caramelized and really a perfect addition. It took what might have been a fine, tart, and flavorful marinade and took it to the next level. It was smart. 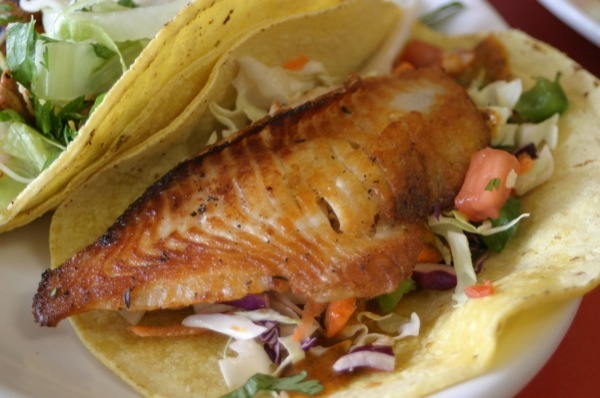 The fish tacos were also thoughtfully made. They came with a unique cabbage slaw and a specially made lime salsa that really balanced out the flavors well. Nice touch, making these some of the most memorable fish tacos that we've had to date. The carnitas was slow roasted shoulder meat. It was very good and very simple, as carnitas should be. I think that in order to fully enjoy it, you would be wise to order it as a "platillo" (not actually on the menu, but they'd surely do it for you), sitting by itself next to some beans and rice. The barbacoa was also slow cooked and subtle, almost brisket-like. It was not infused with lots of flavor or a sauce, just simple meat. I imagine it being best in a burrito or enchilada. The tamales were another surprise. They were about twice the size of your average tamal. As mentioned above, we had pork with green sauce and chicken with red. I think next time I would try pairing them the other way. The subtle carnitas in the pork tamal would have been fantastic with the red sauce, which was much like the guajillo sauce on the enchiladas, but with the added sweetness of grapes and a mole-like touch of cinnamon and clove. Yum. The green sauce, made in-house, was quite sour, and chef Miguel let us know that although it is not standard, this is the way he likes it. It's also not very spicy, another contrast to many salsa verdes we've had. 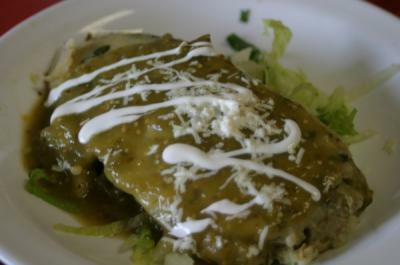 Overall, the tamales were fine and if you like smothered tamales where sauce is part of the experience, try these. If you are looking for simple, in-the-husk tamales, pass. We finally made our way to the enchiladas, served as a lunch sized portion with two enchiladas and a side of beans and rice. The sauce was by far the stand out here. It is deep red in color and complex with a nice little kick, but not at all overwhelming. I sense that it would go well not just with the chicken (how we ordered it) but also with the steak, carnitas, and/or barbacoa. 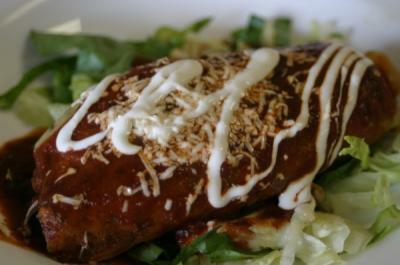 They were really a nice rendition of enchiladas and the chicken was not (like one online review said) cardboard-like. The beans and rice were nothing special and I think that we learned why. We love beans and when you are speaking about an already simple side such as refried beans, the smallest things make a difference. They seemed to be missing something and after talking to Miguel, it was clear what it was. He uses absolutely no oil in these and I'm sure that has something to do with the clientele. We've run into this before....namely, the fear of fat from our fellow Americans. It is great that they are trying to serve their clientele and it seems to be working for them, so I say go for it. For us? Give us a dose of that lard or butter, cause it surely adds a richness that makes beans extra tasty. We were quite pleased with our visit, from the excellent and unique take on Mexican food, to the extremely friendly owner and chef. As always, we would like to leave you with a few recommendations. 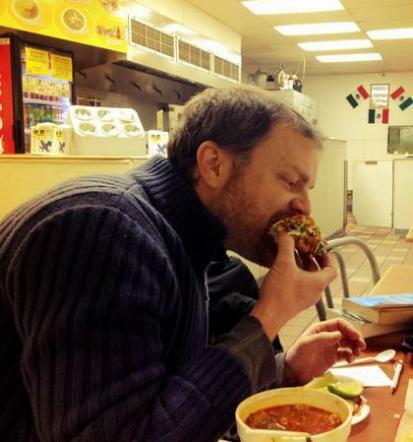 For starters, I would definitely have the soup again and the al pastor and fish tacos were sure favorites. Near the end of the meal, Miguel brought us a small green chili burrito and it was really quite good and I would be tempted to have one of those. The carnitas was so rich and tender that I would highly recommend them, but again, the question is how they should be served. I would either attempt to order the carnitas as a platillo, as mentioned above, or a carnitas torta might be even better. Finally, keep your eye out for the ever-changing specials which appear at the top right of the menu boards. That's where the real treats lie. As always, enjoy...and let us know what your favorites are. Breakfast served on saturday/sunday from 11-3...all items $6 including chilaquiles!!! Lawrence Black is a writer and editor at Simple, Good and Tasty. He can be reached at lawrence@simplegoodandtasty.com. Beware of his crazy eyes as they search for the next great Latin eatery as well as his almost constant onion breath. Peee-ew. Our last Latin Tongue review was: Somos Peru.